In 2011, Mano al Hermano was created as a spin-off from the Interfaith Community Outreach to specifically reach Spanish-speakers. Since then, Mano al Hermano has evolved into an organization with three programs unique to the Outer Banks: Family Literacy Program (FLP), Roanoke Island Community Garden (RICG), and Community Education and Outreach Program. The Family Literacy Program (FLP) is Mano al Hermano’s home-based tutoring program, as well as its largest, most recognizable one. The FLP aims to improve a broad range of competencies related to literacy — reading, writing, speaking, and listening. The FLP has 44 volunteer tutors who make weekly visits to their students, usually for a minimum of one hour. Each session includes helping students with homework and school projects, modeling good work habits, and building literacy skills. 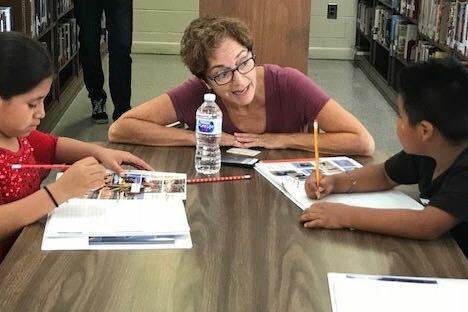 Since most tutoring sessions take place in the family’s home, tutors also help bridge the gap between home and school, helping Spanish-speaking parents by supporting and encouraging involvement in their children’s education. As of summer 2018 there were many changes at Mano al Hermano, which left staff vacancies, one being the FLP Coordinator. 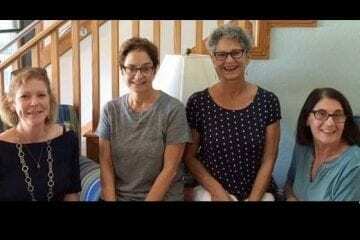 Pictured left to right: Maureen King, Susan Pfaff, Barbara Hardy, and Francene Kelly. Last fall, four retired teachers, all tutors for Mano al Hermano, volunteered to take over the leadership role for the FLP. The FLP Administrative Team has worked together to rebuild and reorganize the program with new energy. Children & Youth Partnership has generously given Mano al Hermano use of their building for office and meeting space. CYP has also become the home of the FLP’s growing library of books and educational materials that can be borrowed by tutors to use at their tutoring sessions. The team is delighted about the 57 students currently being served. With a wait list of 26 students and only 44 tutors, there is a great need for additional volunteers! Avenue Waterfront Grille is creating a fundraiser to support Mano Al Hermano on 28th April. All the proceeds will be donated. And I believe they are still looking for volunteers to help with the event!